The Balsam Fir is the traditional Christmas tree of New England, renowned for its aromatic, soft needles and excellent needle retention. The needles are a deep green and have the fragrance that we associate with Christmas. Grown in our high altitudes, the Vermont Balsam Fir endures our long winters in a blanket of snow that melts away in the spring to become bubbling brooks that supply water to keep our trees fresh and deep green-blue. Having a fragrant Balsam Fir in your living room will make you feel that you walked into a Vermont forest as the Balsam fragrance permeates the room. Try one of these wonderful Christmas trees this year. 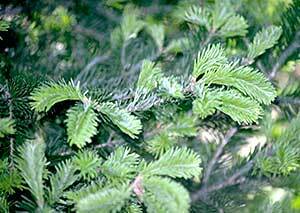 The best Balsam Fir in the world is grown in Vermont. Nine to ten years in the field are required to produce a 6-7 foot tree.